During the last fifty years, I have been in countless antique shops and junk shops, and I’ve examined a lot of porcelain and china. In fact, the abbey owns a large set of 100-year-old fine china made in Limoges that has never been removed from the shipping boxes after I moved back to North Carolina from San Francisco. Using fine china is just too fussy to be bothered with. Whereas heavy commercial china is a whole different story. There were other good makers of heavy American porcelain, but Buffalo China stands out. When I first moved into the abbey seven years ago, having gotten rid of my everyday dinnerware before the move from San Francisco because it wasn’t worth shipping, I bought cheap glass dinnerware to use temporarily, planning on finding something nicer to replace it. I looked at a lot of heavy china at places like Williams-Sonoma and Crate & Barrel. But it was expensive unless it was made in China, and I refused to buy Chinese china. Finally I decided to go with Buffalo China. It’s easy enough to find on eBay, at wildly varying prices. 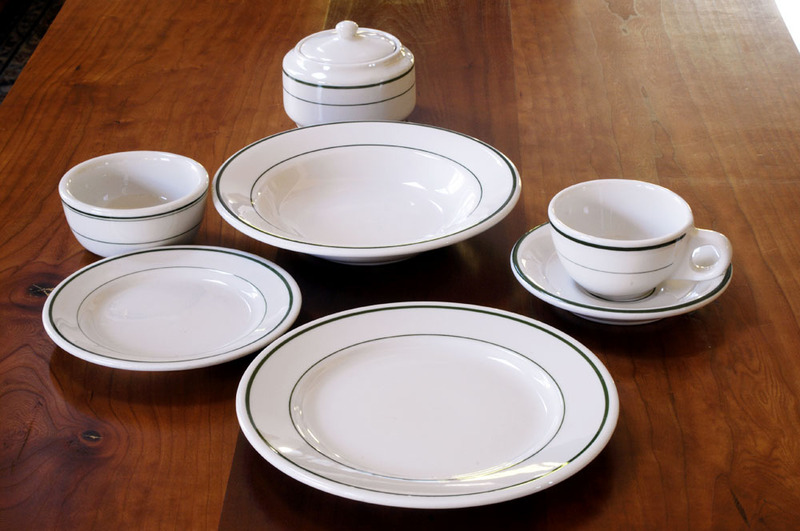 I settled on the green stripe china, though Buffalo china made several other patterns for restaurant and commercial use. It’s not uncommon to come across new old stock Buffalo china on eBay, though the stuff is so durable that, if it’s used, it hardly matters. That’s the beauty of restaurant china — you can’t kill it. I don’t think I’ve ever broken a piece of restaurant china, and, if you ever did, it would be nothing to cry about (though it’s not exactly cheap anymore — more and more people know what it is). These days, large plates are the norm. I admit that I like the current style of food presentation, in which small amounts of foods are presented on enormous plates. But, with the old restaurant china, it’s difficult to find a plate larger than nine inches. I’ll live with that, but I’ll keep watching eBay. Meanwhile, I wish someone would write an illustrated history of Buffalo China. I’d buy it. Update: Also see this newer post on the Buffalo China dogwood pattern. This was written by daltoni. Posted on Friday, February 5, 2016, at 6:07 pm. Filed under Food, The way we were. Bookmark the permalink. Follow comments here with the RSS feed. Trackbacks are closed, but you can post a comment. Replacements, Ltd in Greensboro seems to have everything. I bought “seconds” to fill out set & could barely detect the flaw. It is an awesome place to visit – about 5-6 miles east of Greensboro on I-40/85. I’ve got to give a hell yes on this one. Jo is right. You MUST go to Replacements Unlimited. It’s right off of I-40, and there are billboards. It’s just on the other side of Greensboro from you. You can’t miss it. And it is fun, fun, fun. Road trip! You also can look up Oneida patterns. Ha … I believe it is. It’s funny to think of “patterns” for ordinary commercial diner porcelain. Looks like I need to make a trip to that place… Thanks! Appears there is limited stock available in your “pattern.” Did see they have 3 luncheon plates (seconds)at a reasonable price. Almost as large as the dinner plate. I happen to be friends with the person that recently purchased Buffalo China/Niagra Ceramics. He has the plates that you referred to and many more. They are between 11 and 12 inches. In many cases the plates and thousands of other pieces are being sold for $1.00 per item. I am interested in Purchasing Buffalo 1001M coffe Mugs. They are about 20 oz and they are white. Anyone who can help me with this would be a friend for life…. Check out The Book of Buffalo Pottery by Vi and Sy Altman. It is the best source about Buffalo Pottery. There is another one but not as good. Philip Larkin, Grandson of the founder also wrote a self published book about the history of the company. It is a great story starts with Larkin Soap Company who hired Frank Lloyd Wright to design company headquarters. A china outlet is open in buffalo n.y. its located on route 5 just across from the ford plant. They have many of the buffalo china patterns available. The last of the remaining American made product from the factory can be bought through that outlet’s online store http://www.716china.com or by giving them a call on the phone. It’s too bad all the Buffalo China is made in China instead of Buffalo. It is not the same quality at all. It won’t take most people too long to figure out the quality just isn’t there anymore with the foreign made product. Buy American! George, I have a piece of Buffalo China that starts with a “P”…..where would that have been made..do you know? Some interesting facts on Buffalo China. About 1965 or 66, Carborundum Co. looked into purchasing Buffalo China from Harold Estee family, so they sent John Heebner in to evaluate and run the company About 1968, John decided to buy the company when Carborundum decided to leave. He found a group of investors, bought the company and was President. He started the turnaround to profitability and modernization. About 1978 he built a large addition with two new kilns, forming and glazing. In 1983, Oneida purchased Buffalo when overseas competition began and starting impacting the company. 1986 the decision to start a manufacturing operation in Juarez Mexico was begun to fight imports that would price 25% below Buffalo pricing, no matter how low. That plant made cast, formed cups and ram pressed product. At the time it started processing, it had the highest import duty on the border for commercial restaurant China at 35%. The demise began when Congress voted to drop the import duty to 0% over several years. By the early 1990s, business was struggling against imports. Buffalo, Syracuse, Shenango, Hall, Sterling etc. China Companies all began to fail. That lead to the sale in 2003 and start of Niagara Ceramics. John Heebner and the board of directors of Oneida Ltd. did work hard to make it competitive against imports, but it just wasn’t enough. Can you please connect me to the person who bought Buffalo China / Niagra Ceramics? I am looking to purchase some pieces for a specific design that Replacements Inc. does not carry. Thank you for your help. China is called “China” because the Chinese invented it. When we toured Meissen, we learned that the secret of porcelain was brought from China. To add to this sad story, at one time, fraternal organizations flourished in US and reached their height in membership in 1920’s. This is why you’ll find meeting Halls in almost every town. In each Hall, you’d most likely find a set of ,Buffalo dishes, which were near unbreakable. I love Buffalo China BUT as a ceramics major from WKU the first thing they teach you about clay bodies is that YOU’RE in the Ohio Valley and it’s very coveted ball clay. So up and down the Ohio are potters both pedestal and functional. There are small operations and large ones. My personal favorite-Homer Laughlin. Making everything from fine china to restaurant ware to everyday table ware like FEISTA WARE, which is cool but I’m an Eggshell girl myself. Pretty sure Homer Laughlin is still based and manufacturing off the Ohio. Oxford from Brazil is also a great brand. I could not agree more. There is just something about Buffalo china. I work for the US Forest Service and we had it in our old ranger stations. The china was as beautiful as it was solid. Very “old school” quality that they just don’t make anymore. I was hooked and started also collecting the green stripe. The china is expensive so when I heard about a church that was closing and had a bunch, I bought it all! Maybe a thousand pieces, but I just could not let it go to the dump. So for the first (and probably only) time I opened a Ebay site to sell off the pieces. There is money to be made, but the shipping is a bear (platters weigh 3+ lbs!). A labor of love to save a small piece of vintage americana is worth the effort. Thanks for the article! John Heebner was my uncle and the last owner of BUffalo China . He was heart broken when he sold it to Oniada and then closed . When I was a young man I think he had hopes of me getting involved and eventually taking the lead . I’m glad that I didn’t . The joke in the family was that Buffalo China was so tough that if you dropped it and caught it on the first bounce it wouldn’t break ! I recently bought 37 pieces of an early 1900s Larkin Buffalo China dinnerware set.It is the blue Arlington pattern. Although a bit crazed it is in excellent condition with only two pieces slightly chipped. It consists of an 8 piece place setting, two serving bowls, and very large platter. I bought the set at a consignment shop for $20.00. Anyone know it’s value? Wonderful post! I am the granddaughter of Harold M. Esty, Jr. who was once the President of Buffalo China. He was a grandson of John D. Larkin. He retired on 1 June 1979 but remained on the board of directors until Oneida bought the company in 1983. So fun to read the post and comments about this wonderful china. Needless to say, we all grew up swimming in the stuff. I’ve given away more than I now own. But, I still do collect the rarer pieces at auction. It is sad that it’s gone. I remember going to the factory as a girl and my grandfather making me dropping a plate on the cement floor to show me how unbreakable it was. Good stuff.